The background: President Obama hopped a plane (actually, Air Force One, but “hopping a plane” makes it sound a lot more casual, which is what I think he was intending, a casual weekend where he could chill out away from the limelight) down to Florida for a long weekend of golf while Michelle and the kids went out west to go skiing. The President’s team kept the press away from what was essentially a private golf course, and hence were unable to take any pictures of his swing the entire weekend. Tiger Woods was in the house, and he was going to play golf with President Obama! I’m sure the rest of the world yawned, but in the world of golf, this was a pretty big deal. Looking at the tick tock, this was 7:52 AM EST. By the time the evening news rolled around, the media were trying to make it a big deal that they hadn’t been invited to the Tiger/Obama foursome, missing the point that that would have turned the foursome into an eightysome, which can be quite disturbing on the golf course. And still most of the rest of the country yawned. But in the golf world, we wanted more details. Lots of them. Rosaforte, get your — out on that golf course and tell us what’s going on! What kind of clubs does the president play with? Did Tiger give any tips to the Prez to improve his game? If so, what??? Did he treat the rules with some casualness, as apparently did President Clinton, or did he play it straight and take no mulligans or without kicking any balls out of the rough? This is the leader of the free world, man, we want to know what his game is like, how he swings the club, how accurate he is on the approach! Whoa…well, a good short game, that’s always a good thing, of course. I aspire to a better short game myself, and many of we amateurs do. But Tiger left out sooo much one can’t help but be distracted by the absence of any commentary about the President’s driving off the tee or his play from the fairways. Is he long off the tee? Is he a complete disaster with some crazy left hook? What??! And what about his irons? Mid-irons can tell you a lot about one’s game? Both about their ball flight and tolerance for risk, never mind their course management skills. Course management equals strategy equals possible insight into what he might do about Iran’s nuclear situation! And what about the pace of play? Does he time himself racing around the course like the former Presidents Bush, playing as if on deadline (which I could never understand…isn’t it kind of the point in playing golf to take your time and relax??? ), or did he play at a pace such that he might get threatened by Tour Commissioner Tim Finchem for hovering too long over his putts?? I guess we’ll just have to hurry up and wait — kind of like the White House press corps. Hurricane Sandy is rapidly approaching the Atlantic coast of the U.S.. As of 8 a.m., the huge storm was producing sustained winds of 85 miles per hour after turning north northwest toward the coastline of New Jersey, according to the National Hurricane Center. The center of the storm is now moving at 20 m.p.h., a significant speedup from earlier in the morning. If it’s Monday, it must be time for a Hurricane. And I’m not referring to the cocktail emanating from Pat O’Brien’s in New Orleans. 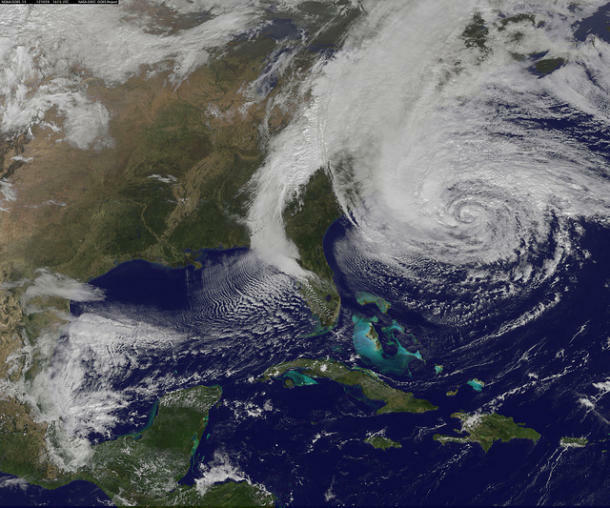 Hurricane Sandy is drifting up the Atlantic coast and is expected to make landfall later this afternoon, probably somewhere in New Jersey. But as of 8:52 CST this morning, she’s already having an impact well in to New York City. I’ve already seen Twitpics of Battery Park City starting to surrender to the surge, which is truly frightening considering how much of the storm is still yet to come. As an FYI, both The New York Times and The Wall Street Journal have eliminated their paywalls and are making their content free, if you’re looking for up-to-the-minute updates on the storm. YouTube is also streaming The Weather Channel (where NBC’s Al Roker was just seen trying to stay vertical at Point Pleasant Beach, New Jersey). I spoke with a good friend of mine who lives on the edge of Cobble Hill (in Brooklyn), and he indicated the water had not yet lapped over the piers there, but that it was likely only a matter of time. Forecasters are expecting a 6-to-11 surge when high tide strikes around 8 tonight. New York governor Andrew Cuomo just held a press conference and announced the closing of both the Holland and Brooklyn Battery tunnels at 2 P.M. EST. If you’re interested in seeing more detaila about the storm, Google’s offering up its “Crisis Map” here, and a more specific look at NYC here. On Twitter, the National Hurricane Center is offering facts and tips at @NHC_Atlantic, and the Weather Channel can be followed at @weatherchannel. I was living in NYC in 1985 during Hurricane Gloria, and that storm paled by comparison. So, please, be safe out there, stay away from the ocean, stay inside, and ride this sucker out as safely as you can! UPDATE: I just built this Turbo Sandy Twitter list, with a list of followees from a variety of media and government sources, including the Weather Channel, NASA, FEMA, and a variety of others. Half of all U.S. adults now have a mobile connection to the web through either a smartphone or tablet, significantly more than a year ago, which has major implications for how news will be consumed and paid for, according to a detailed new survey of news use on mobile devices by the Pew Research Center’s Project for Excellence in Journalism (PEJ) in collaboration with The Economist Group. 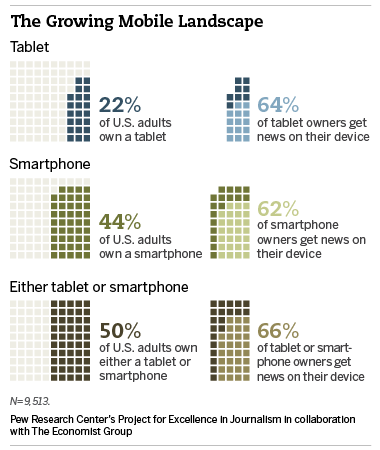 So how do you prefer to consume your news on your mobile device? A new study from the Pew Research Center’s Project for Excellence in Journalism indicates that half of all U.S. adults now have a mobile connection to the web through either a smartphone or tablet, which is much higher than even a year ago. But we’re also seeing that users are moving from “snacking” on news via their mobile devices, to reading much longer form content. And moreover, more people are moving towards using a browser and away from using an app for their tablet news consumption. I found this one to be quite interesting, as it’s somewhat opposite from my own behavior. For example, I’ve been a long-time New York Times reader, mainly via their Website (on my Mac), and sometimes via my iPad or iPhone 4. I finally decided to give them some of my hard-earned money, recently signing up for an all-digital subscription. I don’t want no dead tree showing up on my doorstep! I strongly prefer the New York Times app, particularly on the iPad. Call me old-fashioned, but being someone with a journalism background myself, I place great value on design, layout, and yes, usability. So, I save the browser version for the desktop, but much prefer the app on my mobile devices. Going against the trend, as always! Lower cost tablets in late 2011 brought in a new group of tablet owners. There’s growing evidence mobile devices are adding to how much news people get. People who get news throughout the day on their mobile devices are more engaged news consumers. People notice ads on mobile devices and may be even more likely to click on them than they are to click on other digital ads. From their lips to Mark Zuckerberg’s ears! You can read more about new Pew report on mobile news usage here. Blogger’s Note: If you’re a tried and true news junkie, then you have to check out the Magnolia Pictures documentary release “Page One: Inside the New York Times.” The filmmakers take you inside the Times newsroom and the inner workings of the Media Desk, just as the Internet started to surpass print as our main news source and as newspapers all over the U.S. started going bankrupt. Page One chronicles the transformation of the media industry at its time of greatest turmoil. The best part: It features lots of coverage of media columnist and technology curmudgeon, David Carr. But my underlying futility was really about the inability to buy or rent specific content “a la carte” (i.e., be able to buy specific channels of content without having to provide the financial overhead underwriting others) than it was about the quality of the content itself. New models are of digital content development and management are emerging that can help challenge these legacy financial constructs. Today, at the International Broadcasting Convention (IBC), IBM announced it has helped Canal+ Group deliver and archive digital comment. Canal+ Group is the leading pay-TV broadcaster in France, and now will be able to more easily launch and manage new channels and services such as on-demand, web-TV, and even mobile-TV. Prior to its process and archiving overhaul, Canal+ often used separate and isolated systems to manage its services, often making the production process cumbersome, manually intensive and costly. Today, the staff has access to an interactive portal that collates and manages over 170 hours of content per day or 8,000 programs per year, whether from tape, external files or post-production video. The intuitive portal allows multimedia content to flow back and forth in real-time across business units such as programming, advertising, editorial, archiving, production, and distribution. The opportunity I had to sit down and interview Steve Jobs’ biographer Walter Isaacson last week at IBM’s Impact 2012 event in Las Vegas was a kind of career denouement moment for me. Let me explain: In 1994, as I was finishing work on my Master’s degree in Radio/TV/Film (they hadn’t yet added “Internet” to the RTVF degree in 1994) at the University of North Texas, I distinctly remember sending my resume off to the new inner digital sanctum of Time magazine, “Pathfinder,” which had recently been started to put some muscle behind Time’s digital presence. They didn’t hire me, but they did hire Walter Isaacson, who would be asked to run the groundbreaking digital media organization for a short period before he was later promoted to editor of Time and, later, chairman of CNN. As for me, information technology, and the Internet in particular, would become central to Isaacson’s life, first at Pathfinder, later at Time magazine, and of course as the biographer of great figures ranging from Albert Einstein to Benjamin Franklin to Steve Jobs, all of whom were unique innovators in and of their own right. What’s not as well known about Isaacson is that he is a Renaissance Man of sorts himself. To read his biography (see below) is to witness the firsthand account of a personal witness to and participant in American life over these past forty years, one whose own accounts will be cherished for many years to come. I hope you enjoy reading the interview as much as I did conducting it! (Photo by Patrice Gilbert) Walter Isaacson is the president and CEO of the Aspen Institute, a nonpartisan educational and policy studies institute based in Washington, DC. He has been the chairman and CEO of CNN and the editor of TIME magazine. He is the author of Steve Jobs (2011), Einstein: His Life and Universe (2007), Benjamin Franklin: An American Life (2003), and Kissinger: A Biography (1992), and coauthor of The Wise Men: Six Friends and the World They Made (1986). Isaacson was born on May 20, 1952, in New Orleans. He is a graduate of Harvard College and of Pembroke College of Oxford University, where he was a Rhodes Scholar. He began his career at The Sunday Times of London and then the New Orleans Times Picayune/States-Item. He joined TIME in 1978 and served as a political correspondent, national editor, and editor of new media before becoming the magazine’s 14th editor in 1996. He became chairman and CEO of CNN in 2001, and then president and CEO of the Aspen Institute in 2003. He is the chairman of the board of Teach for America, which recruits recent college graduates to teach in underserved communities. He was appointed by President Barack Obama and confirmed by the Senate to serve as the chairman of the Broadcasting Board of Governors, which oversees Voice of America, Radio Free Europe, and other international broadcasts of the United States, a position he held until 2012. He is vice-chair of Partners for a New Beginning, a public-private group tasked with forging ties between the United States and the Muslim world. He is on the board of United Airlines, Tulane University, and the Overseers of Harvard University. From 2005-2007, after Hurricane Katrina, he was the vice-chair of the Louisiana Recovery Authority. He lives with his wife and daughter in Washington, DC. Turbo: First of all, thank you for taking the time to speak with me, I know you’re very busy. You’ve now written biographies across a range of iconic figures of American life — Einstein, Franklin, Kissinger, and now Steve Jobs — I’m curious across all of these if you start to see some common traits and characteristics? Walter Isaacson: Yeah, well like I said in the speech today, curiosity, a passion for what you do, an ability to think different, an ability to be imaginative and to think out of the box. You know Steve’s great mantra was “Think Different.” He also loved “Stay Hungry, Stay Foolish.” The fact that Einstein and Benjamin Franklin, even in their final years, were thinking different, being creative, being innovative….to me, that’s the goal of life. Turbo: Were there other characteristics? Some not so positive? Walter Isaacson: And Franklin says, “I was never very good at the virtue of humility, but I was very good at the pretense of humility…I could fake it very well. And I learned that the pretense of humility was as useful as the reality of humility. Because it made you listen to the person next to you, it made you try to see if you could find common ground.” And that was something that was part of the nature of Benjamin Franklin. It was not part of the nature of Steve Jobs. But, that’s why biographies are not how-to manuals…they’re tales about real people. And you have to extract the lessons from each character that you think might apply to you. So for me, I’ll never be a genius like Steve Jobs…I’ll never drive to the concept of an iPad, drive into existence an iPad…I’m just not that genius…but I try to think about Steve’s passion for perfection, and I also try to think about Ben Franklin’s ability to bring people together, and be very nice and kind to people of all walks of life. Turbo: I know you conducted 40-something interviews with Jobs, and I know you spoke with a lot of his friends, his family members and even his rivals…Was there anything that they all consistently said when they talked about Jobs as a person? Walter Isaacson: I think that they consistently said that he was on the surface, very impatient and petulant. But once you got to know him, the important thing to understand, was that the petulance, that brattiness at times, was connected to a passion for perfection, and that’s what the narrative of the book is about, which is anybody can be a jerk. It wasn’t that Steve was a jerk, it was that he had a passion for perfection and that’s why by the end of the book, you should be admiring him. Turbo: We got to speak with Steve Wozniak at our IBM Pulse event earlier this year, and I asked him…and I’d like to ask you the same question I asked him, which is what do you think the world lost with him leaving us so soon? Walter Isaacson: I think Steve was a person who reinvented at least seven industries: Personal computing, the music business, retail stores, digital animation, tablet publishing, journalism, phones…he would have reinvented more industries — digital photography, textbooks, television — we lost with Steve somebody who, because of his ability to think different, was able to transform industries. And that’s what the book is about: Sometimes you have to have a driven, intense personality in order to have the passion it takes to change industries. Turbo: Okay, thank you for that. I wanted to now take a step back in time to 1995-1996…I don’t know exactly what year it was, but I believe it’s when you took over the Time digital arm, Pathfinder. Turbo: Could you just describe for me that time at Time? Walter Isaacson: It was very interesting during that period. In the early 1990s, there was a sea change happening. The Internet up until then had been based on community and networking and chat. It had the BBS boards of the original Internet, you’d had the communities like The Well, and you had online services like CompuServe and AOL, where people gathered in chat rooms and on bulletin boards. In the early 1990s, there was a shift from that type of Internet to a web-based Internet. That had some great advantages, but a few disadvantages. The Web became a place that we could put all of our content up on Web sites, but it was more of a publishing medium than it was a community medium. You know, comments got relegated to the bottom of the page, as opposed to the smart bulletin boards and discussion groups, and Listserves, we used to have before the Web dominated the Internet. Secondly, the business model for putting up your content online with a service like CompuServe or AOL, you would make money because people paid to be on those services, and people shared the money with you, if you were Time magazine. But once you started to put stuff on the Web, it sort of became free, and it undermined to some extent the business model of having journalists and bureaus around the world. Of course it had much more of an upside than it had a downside, because it opened up reporting and journalism and commentary to everybody, not just those who owned a magazine. Turbo: What are your thoughts on the greater impact of not only the commercialization of the Internet, but some of the trends it has enabled. If we look at some of the workforce dislocation, and creating new market opportunities in countries like India and China, because of this wonderful connection via first satellites and later the Internet…When we’re looking back 100 years from now, what do you think historians will be saying about this time? Walter Isaacson: They will be saying that the Internet was, like every information technology starting with the invention of papyrus and paper and Gutenberg’s movable type, that it empowered individuals. The free flow of information tends, over the course of time, to take power away from authorities and elites and empower individuals. The Internet’s role 100 years from now will be this transformation that not only did it take power away from the elites and mainstream media, but also the people running authoritarian regimes around the world. Walter Isaacson: I don’t think that it’s a simple process where free flow of information automatically leads to democracy. Because you’ll have a lot of back and forth. But, it does bend the arc of history towards empowerment and democracy and, eventually, whether it takes 10 or 50 years, what’s happening with the Arab Spring, what’s happening in China, what’s happening in many places, will be a trend towards more personal freedom and more democracy. Turbo: You were chairman of the Broadcasting Board of Governors, and for people who don’t know them, they oversee Radio Free Europe and the Voice of America. What’s the changing role of the Board and the VOA in this increasingly Internet connected world? Walter Isaacson: I think that if, sixty years ago, when VOA and Radio Free Europe were being created, if they had had the ability to sketch out on the whiteboard what would be the perfect technology to help their cause, they would have invented the Internet. Something that doesn’t respect national boundaries that well, that allows people to find proxy servers to get through to information they need. So there will be a big shift towards digital information. And I hope towards community and discussion, not just handing down information the way Edward R. Murrow would have done when he ran Voice of America but creating communities and discussions that can be facilitated by the Internet. Turbo: A couple of other quick questions…You have deep roots in New Orleans: You grew up there, you went to school there. And after Hurricane Katrina, Governor Kathleen Blanco appointed you vice chairman of the Louisiana Recovery Authority. We’re now seven years on — how do you feel New Orleans is doing? Have you been back recently? Walter Isaacson: I go back all the time. And New Orleans has not only come back, but in most ways, it’s better than before the storm. 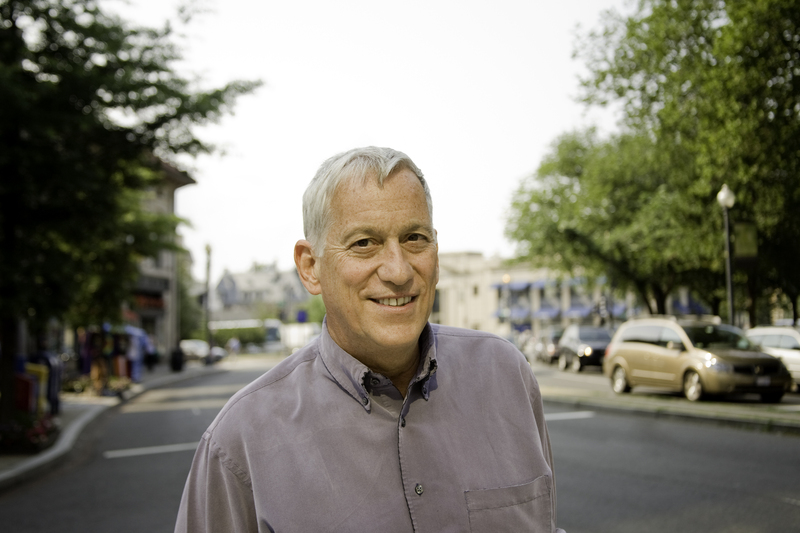 Walter Isaacson: We have a better school system. More choice for kids in the schools. More than 70 percent of the kids are in charter schools which allows innovative, entrepreneurial people like KIPP Academy to create schools that stay open until seven in the evening, eleven months a year, which is the way we should have education in our society. Likewise, there’s more entrepreneurship in New Orleans. I think Forbes magazine called it maybe the best city for startups and entrepreneurship because so many young people are coming in. There’s a brain magnet in New Orleans. Teach for America has almost tripled in size in New Orleans since before the storm, bringing young people in who want to be part of the educational renaissance there. Tim Williamson has created Idea Village, which is an incubator for start-ups right in the heart of New Orleans. Tulane University has three times as many applicants as it did before the storm because eager, adventurous, entrepreneurial people want to be part of a city that’s rebuilding. Mitch Landrieu is a great mayor — we have a political system that is much better than it was before the storm. There are even more restaurants than there were before the storm, probably more bars. So, for those of us who were worried that New Orleans would never come back, it is a great case study not only in resilience, but in reinvention — to say, if we were to build a school system from scratch, would we build it the same way we had it before the storm? No. Let’s start a more entrepreneurial school system where the schools are open later, they spend more of the year where they compete for students, and you’ve had double-digit test score gains, every year for the past three years. So, these are the types of things that keep me coming back to New Orleans, but also make me glad that so many young tech and web entrepreneurs have moved to the city to create this vibrant start-up community there. Turbo: That’s great. My ears perked up in your keynote when you talked about how you’re working on this new book about the information revolution. Any themes you’re starting to see in your research that you can share with us in advance of its publication? Walter Isaacson: One major theme, which is the theme of the Steve Jobs book and everything else I’ve written, which is innovation comes where there’s an intersection between the arts and the sciences. When there’s an intersection between poetry and microprocessors. Where a great feel for beauty and design is connected with a great feel for technology and engineering. That’s what Steve Jobs is all about, that’s what Ben Franklin was all about, that’s what Einstein was about. So it starts with Ada Byron Lovelace, the daughter of Lord Byron, who becomes a great mathematician, because her mother doesn’t want her to grow up to be like her dad. And, she also has within her the poetry of her genetic code, of her heritage. And so she works in the 1830s with Charles Babbage, who creates the first prototype of a computer, and she helps describe and envision how computers can become universal machines, and not just mathematical calculators. And then it leaps forward from that chapter to Alan Turing, who also has a great feel for beauty, but helps invent the first computers at Bletchley Park when they’re breaking the German Enigma codes in England. And then to places like IBM, which is doing the Mark I computer at Harvard, and the University of Pennsylvania where they’re doing the Eniac, and the University of Iowa where John Atanassof is creating in the basement of the physics building an early version of the computer. The computer and the Internet are the two most important inventions of the modern era. And yet most people don’t know how poetic, ingenious, and creative the people who invented those things were. In fact, most people don’t even know exactly who invented them. And so this is a tale of inventiveness that will take us from Ada Lovelace all the way to, I hope, people who are doing social networks, mobile computing, and artificial intelligence today. It starts with Ada Byron Lovelace concluding that machines will never think, they will never originate their own creative ideas, and that’s certainly something that Alan Turing explores, but now it’s something that with Watson at IBM, and with the notion of artificial intelligence, is still something we look at and wonder will it ever happen? Stowe Boyd is one of those people you wish you’d met long before you actually did. I did meet him, about six years ago, when the Web 2.0 “revolution” was just taking root up at the MESH conference in Toronto (a conference I highly recommend, by the way. Love my social amigos in the Great White North). Stowe is one of those rare social media gurus who thinks and does — more recently he’s been trying to find time to do more thinking than doing — and for which we’re all the better off. In our chat, Scott and I were all over the map with Stowe, starting with the Cluetrain Manifesto and moving our way through the shifting media landscape to the present day and the future of social business..and much, much more. And Stowe, you can come back and chat with us anytime…but next time, we’ll try to scramble up a few cocktails.